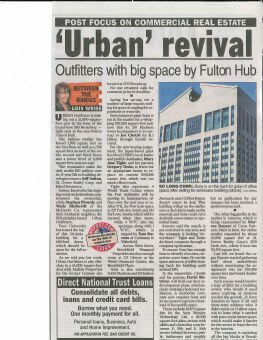 Urban Outfitters is staking out a 21,000-square-foot spot in the base of the brand-new 180 Broadway — right next to the new Fulton Transit Hub. The fashion retailer has leased 1,500 square feet on the first floor as well as 6,700 square feet on each of the entire second and third floors and a lower level of 6,000 square feet, sources said. The economics make the deal worth $50 million over its 15-year life to building developer/owners Jeff Sutton, SL Green Realty Corp. and Harel Insurance. Sutton, known for his ongoing retail orchestrations, represented the ownership, while Stephen Plourde and Wade McDevitt of the McDevitt Co. represented their brotherly neighbor, the Philadelphia-based Urban Outfitters. Pace University has leased the top of this 24-story building for a 600-bed dorm, which should be open for the fall semester. As we told you last week, Urban Outfitters is also thisclose to a 61,000 square-foot deal with Malkin Properties for the former Conway site located at 1333 Broadway. No one returned calls for comment prior to deadline.